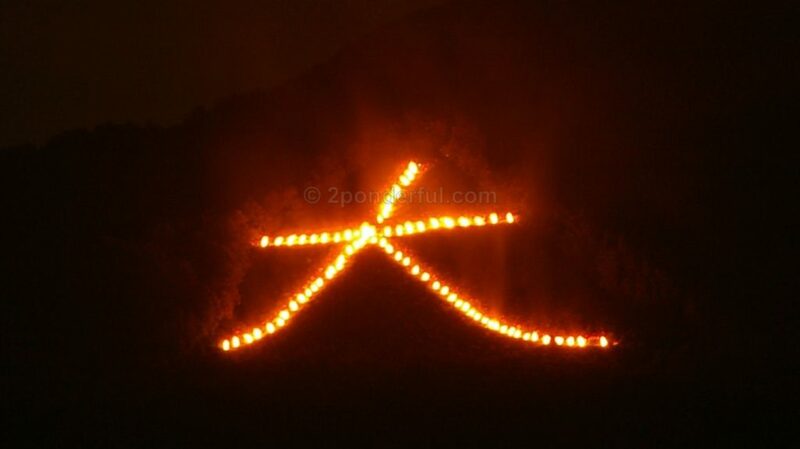 ●the character “dai”「大」 at Daimonji is on the Kamogawa River bank [Map-A]. ●the character”Myou”「妙」 is Kitayama-dori near Notre Dame Jogakuin [Map-B]. ●the character”Hou”「法」 is the Takanogawa River bank (north of Takanobashi Bridge)[Map-C]. ●the character”Dai”「大」 at Hidari-Daimonji is Nishi-Oji-dori [Map-D]. ●the motif “Funa-gata” is the northwest of Kitayamabashi Bridge on Kitayama-dori [Map-E]. 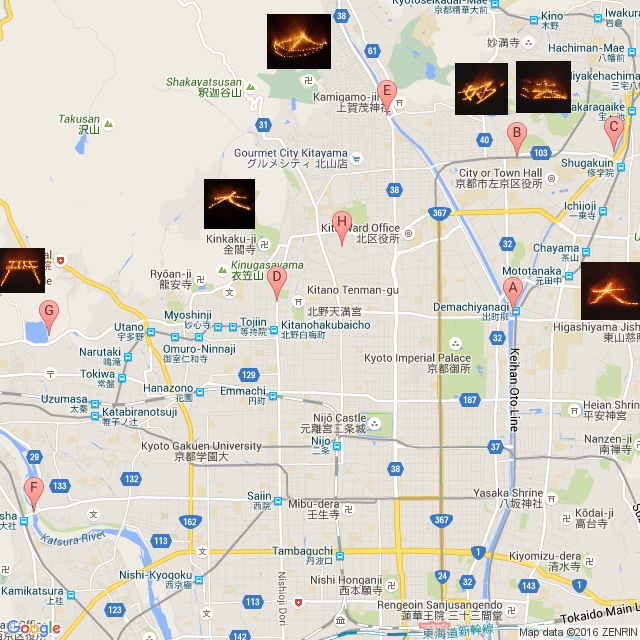 ●the motif “Torii-gara” is best seen from Matsuobashi Bridge [Map-F] and Hirosawa-no-Ike Pond [Map-G]. ●From the highest point of Funaokayama Park (free entry), One of the best viewing spots, you can have a panoramic view of all the mountains without the torii-gata motif [Map-H]. To feel Japanese festive atmosphere, the Kamo-gawa river banks are great. Thousands of people gather on the east side of the Kamo-gawa river [Map-A]. You can only see the “dai” from here, though It’s kinda fun to sit on the grass in the dark with other people of all ages, some wearing yukata.